A wonderful side effect of our television renaissance is the way it’s allowed distinctive artists with their own styles to find a home. It’s okay if they don’t work for everyone; there are countless other options for audiences with differing tastes. The distribution model makes it easier to develop a series without the overhead of a film. The latest beneficiary is Whit Stillman, whose dry wit and charm won him a small but devoted group of fans in the ‘90s. He returned after a 13-year hiatus with Damsels in Distress in 2011, and his style translates well into our world. In fact, it seems more at home today than it did when Metropolitan arrived in 1990. His dialogue sounds different and can be off-putting if you’re new to Stillman’s world. His characters are self-involved intellectuals more likely to correct someone’s grammar than perform a kind deed. Even so, they aren’t bad people and feel more alive in our world of constant chatter on the Internet. Stillman has found the right niche on Amazon with The Cosmopolitans, and the brilliant pilot feels like home to fans clamoring for more of his work. Carrie MacLemore and Adam Brody star as ex-pat Americans living in Paris and trying to connect with a much different culture. Aubrey made the trip for a French boyfriend who’s moved on, while Jimmy’s calling himself a “Parisian” while still being an outsider. They both appeared in Damsels in Distress and are perfect choices to inhabit Stillman’s world. Paris is an amazing city, but they’re still fighting against the loneliness of being there. Aubrey stumbles upon Jimmy and his friends Sandro (Adriano Giannini) and Hal (Jourdan Rountree) at a cafe. They strike up a friendship and end up a party hosted by the wealthy Fritz (Freddy Åsblom). The plot is secondary to the conversations, however. The chat between the three guys at the cafe is classic Stillman and hits on issues of romance and differing worldviews with charming aplomb. No matter what the environment, Stillman’s characters are familiar and speak in a specific manner. They could be sitting in a disco, attending a deb party with the urban haute bourgeoisie (the UHB! ), or going to a party in Barcelona. The music and setting are different, yet they spring from a certain mindset. Stillman lived in Paris for years as a writer, so he understands the mindset of these characters. He’s certainly spent time at cafes discussing art and trying to make sense of the world with friends. It’s that personal connection that makes this show more than an exercise. Calling it pretentious doesn’t give Stillman enough credit. It may not speak to everyone, but that dismissive reaction is too easy. There’s a lot to enjoy with this 26-minute pilot, especially when it comes to the memorable dialogue. During one discussion about putting an ocean between a break-up, a retort about the Pacific versus the Atlantic is pitch perfect. On the page, these lines might seem stilted. They come alive with the right actors, however. 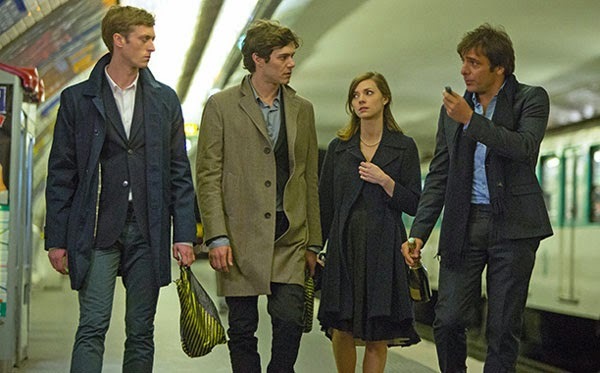 The Cosmopolitans hits on familiar themes that should charm Stillman fans. There’s even a callback to the Sambola, which Greta Gerwig’s Violet was so determined to make an international dance craze in Damsels in Distress. 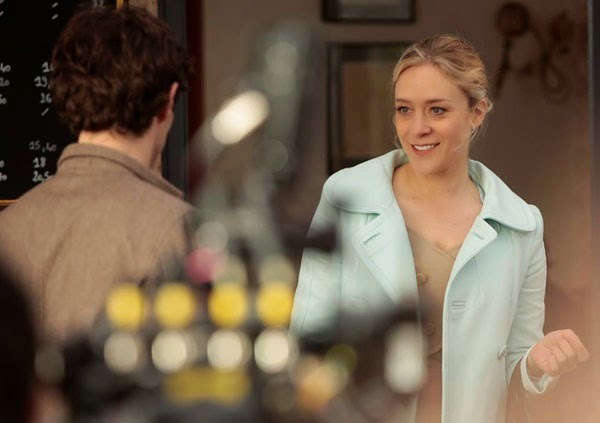 Chloe Sevigny makes brief appearances as Vicky, the arrogant “gold coat girl” that lives comfortably in this Parisian world. She’s been marketed as a lead to sell the show but is really a guest player. Her presence drives Jimmy crazy and injects a good deal of fun into the episode. Dree Hemingway (Ernest’s granddaughter) also makes a brief appearance as an attractive Canadian that Jimmy meets at the party. There are no misses in the cast, and even the bit players strike the right notes. The episode moves briskly and ends just as we’re getting to know the characters. Amazon has released The Cosmopolitans as part of its third season of pilots where viewers get the chance to decide their fates. Judging by the response thus far, I have a feeling this won’t be the last that we hear from these characters. Stillman isn’t a household name but has fans among critics that will make the case for its success. I’m a longtime fan and optimistic that we’ll see another five episodes. Even so, let’s not leave it up to chance. Once you’ve watched this show (and loved it of course), be sure to head to this site and fill out the survey. By choosing to greenlight a full season, Amazon will allow Stillman to create what’s essentially a feature film. The production values are on par with his other work and spotlight the beauty of Paris. The city plays a key role in the show’s success, and it’s just the right setting to spend time with Aubrey, Jimmy, and the entire gang. I can’t wait to see where they go next, and this pilot sets the stage for an incredible series. I'm glad you brought this up! I haven't had time to watch it yet, but it wouldn't have even been on my radar without you talking about it. I've tended to assume that Amazon's pilots were lame wannabes, but I didn't realize they had talents like Whit Stillman contributing stuff. Looks like Amazon is really serious about competing with Netflix in the original content arena! I've been surprised to notice how many of the Amazon pilots have talented filmmakers behind them. This is the first one that I've watched so far. The production values were on par with Stillman's films, and it essentially felt like the first part of one of his movies. I'd definitely suggest that you check it out. Plus, it's only 26 minutes! You are right about the writing, it really does shine the brightest. I liked the episode too but it found it too short. It was more a tease. I mean this in a good way. I've only seen Damsels in Distress from Stillman but I understand what he is going for, what his films feel like. I've been wanting to check Metropolitan for a while. By the way, have you seen other of the Amazon pilots? I watched Red Oaks which I found pretty funny and enjoyable. In case you wish to check another one I recommend this one. I'd like to check out more of the Amazon pilots, but I haven't gotten there so far. I'm interested in Red Oaks because of David Gordon Green, though his output is all over the map sometimes. I'd definitely suggest watching Metropolitan, and I expect you'd enjoy all of Stillman's work if you liked Damsels and this show. It did feel like the start of a longer movie, so I get what you're saying about it being too short. I've been waiting to hear from the Interwebs on a few of these Amazon pilots. The only one I've taken the time to try was Really. Which was okay, not 100% sold on it yet. Have heard quite a lot of good stuff about The Cosmopolitans. Though not familiar with Stillman. You certainly make a good case for it. I think it's a good intro to Stillman, especially since it's only 26 minutes. I was charmed by it, and the Paris setting doesn't hurt. I know that I'm partial to his work, so it felt very familiar to me.